I’ve been trying to write a post for the last week. Clearly, considering the last time stamp date, this has not happened. Nope, not at all. I have two partially written drafts behind the scenes. What I start, I can’t seem to finish in regards to blogging. I think it has to do with the frustration of the last week and not being able to focus on just one thing. I understand Stitch’s feels here. The #adorabledistraction thought it would be fun to scare the hell out of me. Two emergency vet visits are no fun. I cried from worst case scenarios. The least of my frustration was having to spend $1000. It’s a lot of money, but she’s worth it. I’ll pay what it takes. As a Dachshund she’s prone to back problems. The vet thinks it’s degenerative disc disease, which could either ease off, or leave my girl paralyzed. Right now we’re doing a regiment of pain killers and muscle relaxers with strict bed rest for the kid. It seems to be easing FINALLY so for that I’m thankful. At one point the poor girl had muscle spasms rippling through her lower back for over 15 minutes. That was the second emergency vet trip. The added meds they gave us at that point seem to be helping her through all this. Hopefully, with the relaxing and the bed rest and the laser treatments we’ll have her good to go in a few weeks. 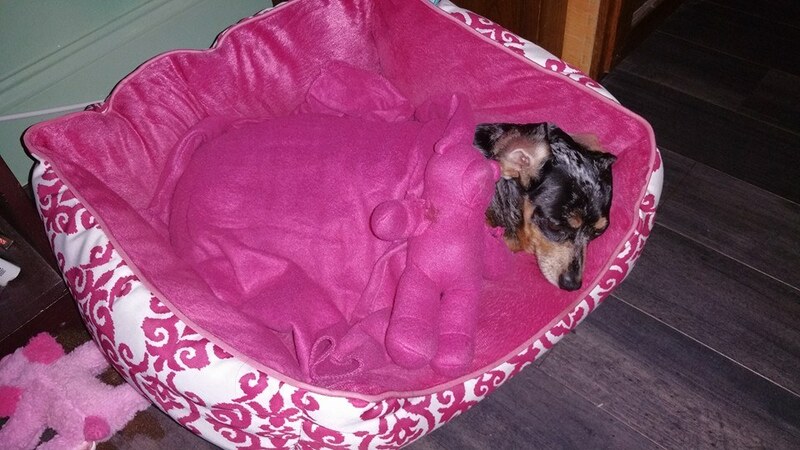 The #AdorableDistraction recouping in her princess bed. Losing her scares me to death. I’ve had her since she was two months old and she’ll be ten this year. She’s my girl and I’m gonna do my best to keep her out of pain and healthy. Aside from that, this week is midterms and I have two papers due. Making sure I have all my ducks in a row for everything has not made things easier. Frustration can duly effect the writing process, but that’s okay. I’ve still managed edits for Redemption and to write more pages for the Renegade my new WIP. At least I’m still being productive and not be completely useless. Sorry about that list bit of bitter. It kills me when the #adorabledistraction is in pain and I can’t do anything for her. It’s another frustration. Then, on top of all that wonderful wonderfullness. I’m sick. It started last night, progressed through today. I’m hoping I nipped it enough that it doesn’t get bad and I can focus on the papers that are due and getting the rest of my work done, while stealing snuggles from the #adorabledistraction. Hopefully, I’ll be able to make my brain blog again soon.